This year, hundreds of attendees and community leaders joined the Summit to hear about the region’s flourishing economy. Spectrum News 13 anchor Ybeth Bruzual presided as the event’s Master of Ceremonies. According to the Bureau of Labor Statistics, Central Florida still ranks number one in the nation for job growth for the fourth consecutive year. Additionally, Central Florida has ranked number seven on the Milken Institute’s Best Performing Cities index for two consecutive years. In fact, the Central Florida region is the 47th largest economy globally, just behind Portugal and Romania. With a renewed focus on regionalism, what’s good for Orange County also benefits Lake, Seminole, Osceola, Brevard counties, Snaith said. The award-winning Orange County Convention Center is the second largest convention facility in the United States. Each year the OCCC attracts more than 230 events to the Central Florida area. As a result, roughly 1.4 million attendees contribute approximately $2.4 billion to the area’s economy each year. 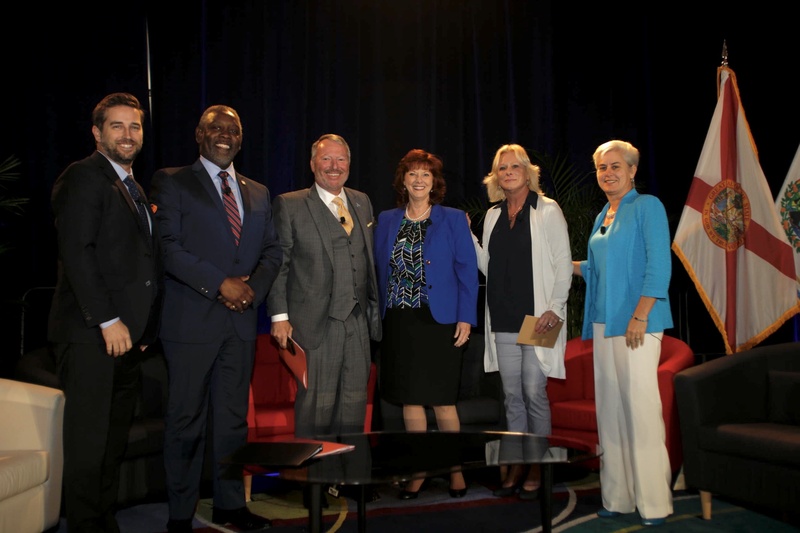 Photo Caption: Orange County Mayor Jerry L. Demings joined Orlando Mayor Buddy Dyer, Seminole County Chair Brenda Carey, Osceola County Chair Cheryl Grieb and Lake County Chair Leslie Campione for a panel moderated by Orlando Economic Partnership President & CEO Tim Giuliani at the Orange County Regional Economic Summit.